The business community praised Finance Minister Jim Flaherty for the fiscal guidance that got Canada through the financial crisis and for his business-friendly policies and tax cuts he introduced and said his resignation Tuesday would not disrupt markets. Economists are not expecting a dramatic impact on the markets from Finance Minister Jim Flaherty's resignation Tuesday. Flaherty made his announcement after the 4 p.m. ET close of the Toronto Stock Exchange. "There might be a little ripple (in the markets), notably in the Canadian dollar, which already took a big step back because of other remarks by another Ottawa policymaker," said Doug Porter, chief economist at BMO Capital markets. "I don't think there is a major implication." The dollar had fallen 0.68 of a cent to 89.79 cents US earlier in the day after Bank of Canada Governor Stephen Poloz gave a gloomy speech before the Halifax Chamber of Commerce in which he predicted slower growth than expected for the first few months of 2014. But the currency held fairly steady in trading on foreign markets after Canadian markets closed, trading at around 89.65 cents US by 8:45 p.m. ET. Economists at the major Canadian banks had high praise for Flaherty, the longest-serving Conservative finance minister, and urged his successor to stay the course. "He has left the fiscal balance on a very good trend, and I think he did an obviously tremendous job to reinforce Canada's AAA rating and to reinforce the credibility of the fiscal objectives that were set post-recession," said Sébastien Lavoie, an economist at Laurentian Bank of Canada BLC Securities. "We cannot forget his contribution prior to the crisis, where he … certainly contributed to economic growth over all these years." There was widespread praise for Flaherty's fiscal guidance during the financial crisis of 2008. "His biggest decision was to a launch a significant fiscal stimulus at the height of the recession and then to carefully unwind it so as to not to dent growth too much during the recovery," said CIBC World Markets economist Avery Shenfeld. "He's been quite effective when things really counted." Shenfeld said he doesn't see Flaherty's departure as signalling "any significant change in Canadian fiscal policy" and was also not expecting it to roil markets. Former Liberal finance minister John Manley, current head of the Canadian Council of Chief Executives, said Flaherty had the respect of colleagues in Canada and abroad. "I think he has been a steady hand, and he has been respected both at home and internationally, so people like that are hard to lose," Manley said. 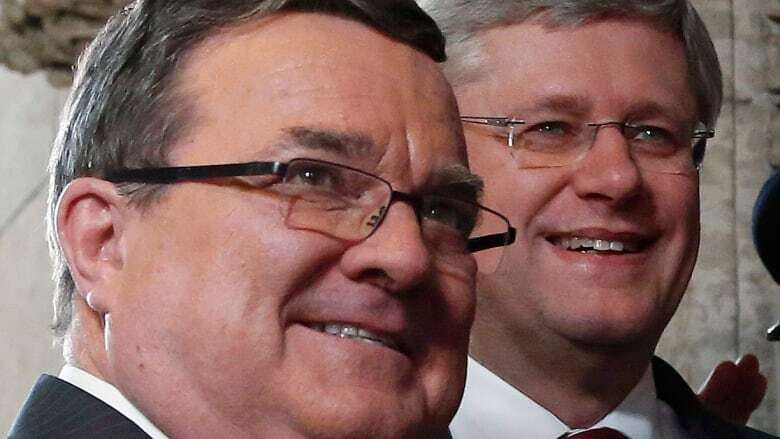 Prime Minister Stephen Harper also praised Flaherty's "steady hand" during the crisis and said he ably guided Canada "through the most challenging economic times since the Great Depression" and earned the country "a solid global reputation for economic management." Armine Yalnizyan of the Centre for Policy Alternatives does not agree that Flaherty’s fiscal management has been prudent. "Anyone can balance a budget. How you do it is what's important," she said in an interview with CBC's Metro Morning. "The more than $220 billion in tax cuts promised in his budgets from 2006 to 2008 stripped the $18 billion budgetary surplus he inherited and undermined our revenue position, making the federal deficit far bigger than necessary, and adding to corporate cash piles that the Bank of Canada governor, Mark Carney, called "dead money". Not one tax cut was delayed or postponed during the crisis," she said. She pointed to the massive cuts to federal monitoring for rail safety, food safety and tax enforcement as part of Flaherty's legacy, as well as the increase inequity in Canadian incomes. 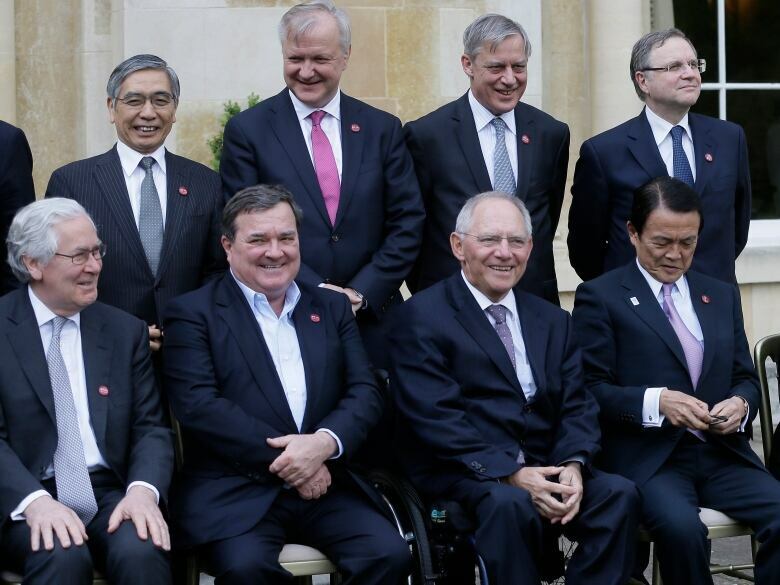 The financial news agency Bloomberg pointed out that under Flaherty's guidance, Canada’s economy outperformed the G7 average in all but one year (in inflation-adjusted terms). But there were some in the financial community who said that while Flaherty controlled spending and was a good steward who got Canada through the financial crisis, he does not leave behind a particularly memorable legacy. "There were a lot of tax gimmicks — the $25 tax credit for your kid playing hockey and the tax free savings account, which has been a big political winner — but I wouldn't say anything tremendously innovative or something that would necessarily build a legacy," said David Baskin, president of Toronto-based Baskin Financial. Even Flaherty's much-hyped Economic Action Plan is not an especially strong candidate for a legacy and is seen as a black mark on Flaherty's record by some, Baskin noted in an interview with CBC Radio. "Some people will say what we'll remember him for is blowing the budget, breaking the bank during the financial crisis, bailing out the car companies, spending huge amounts of money on these projects, which turned out perhaps not to be necessary," he said. "His supporters will say he kept the ship on a steady keel during a very rough period and, in good times and bad times, kept the spending under control. But for me, it's difficult to look at it and say this was tremendous innovation or tremendous wisdom." Erin Weir, an economist with the United Steelworkers union, was critical of Flaherty's slashing of the corporate tax rate from 22 per cent to 15 cent. "That was an extraordinarily costly move," he said on CBC's Power & Politics. "The treasury gave up an awful lot of money and it's not clear that we got much, either in terms of investment or job creation," he said. Several financial analysts discounted speculation that Flaherty's resignation might have been linked to his straying from the party line on income-splitting. Earlier this year, Flaherty backed away from the Conservatives' plans to expand income-splitting options for couples with children — a policy that would be most beneficial where one spouse earns significantly more than the other. "It benefits some parts of the Canadian population a lot, and other parts of the Canadian population virtually not at all," Flaherty said of the policy, which some policy advisers have criticized as a type of social engineering that benefits only wealthy, two-parent families with a stay-at-home parent. But Mark Chandler, head of fixed income and currency strategy at Royal Bank of Canada, cautioned against linking the issue to Flaherty's resignation, which the minister said was a decision he made with his family earlier in the year. "We know nothing that would suggest that there's any schism between himself and anybody else in the party on policy, so I would say that this is not policy related. There's nothing in the statement that would suggest so," said Chandler. Bay Street did not seem entirely surprised to see Flaherty go. "It's not a complete shock, the only question was over the timing," said Porter. "I think the conventional wisdom was he'd hang in there for another budget to show he had balanced the books, but, obviously, he didn't; he decided now was the time." Porter said continuity should be the key objective of whoever takes over from Flaherty. "They don't have to be a carbon copy of Mr. Flaherty, nobody could be, but in terms of the broad policy thrust, I think it was appropriate from a policy perspective, and most people would like to see that continue," he said. ​The Canadian Taxpayers Federation called Flaherty a "friend of the taxpayer," pointing out his taxpayer-friendly accomplishments in a tweet, including his cuts to the GST and business taxes and the introduction of tax-free savings accounts. The Canadian Federation of Independent Business (CFIB) also highlighted the cuts to corporate taxes, specifically the tax thresholds for small business he introduced, as one of the policies that made Flaherty a friend to business. It also pointed to the increase in the lifetime capital gains exemption, which takes effect in the 2014 tax year, the freeze in employment insurance and Canada Pension Plan premiums and the new code of conduct for the debit and credit card industry. "Minister Flaherty has helped strengthen the environment for entrepreneurs in Canada and leaves a legacy of solid and practical policy decisions," CFIB president Dan Kelly said in a statement. The Canadian Bankers Association and the Investment Industry Association of Canada both praised Flaherty's introduction of a voluntary co-operative capital markets regulatory system, seen as a possible first step toward a national securities regulator. "Canada is the only industrialized country without a national securities regulator, and we continue to believe that Canada needs a single national voice on the international stage. Few others would have shown such tenacity as Minister Flaherty has over time on this issue," the Canadian Bankers Association said in a statement. Several rounds of tightening of mortgage rules, which were not universally loved in the banking and real estate sectors. Hands-on attempts to put pressure on some banks and financial institutions to reverse their decisions to lower five-year mortgage rates, which many saw as undue meddling in the free market. The taxing of income trusts — introduced in Flaherty's first year as finance minister and universally loathed on Bay Street and among investors in the trusts.